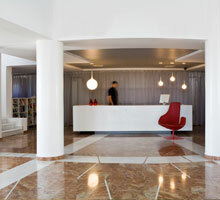 Welcome to the most prestigious 5 star Hotel on the island of Santorini. Overlooking the Aegean Sea, the Majestic Hotel offers its guests high quality service along with the widest variety of facilities to be found on the island. Discover the aura of Majestic Hotel ... From the stylish lounge bar by the pool to the elegant restaurant on the terrace, from the carefully arranged lines of the main lounge to the steamy pleasures of the Turkish Baths, the Majestic Hotel creates an atmosphere of absolute luxury and relaxation. Location: Standing over the astounding volcanic caldera, 500m from Fira town center (capital), 6 km from the airport and 6 km from the port. Conferences: If business is the purpose of your visit, you will find that our facilities include the Convention and Business Centers with the latest audiovisual technology. 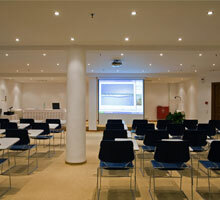 There are two conference centers in The Majestic Hotel and an open air amphitheatre. The "Thesis" Conference Center at the Majestic Hotel is able to cater for 130 participants when organized in theatre style and 60 when organized in school style. The "Vesta" Conference Center can hold up to 50 participants. There is also an Executive Meeting Room for 10 participants. 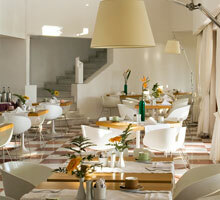 Ostracon Pool Bar Spa Hall with full Body & Facial treatments, Aromatherapy, Sauna & Turkish bath & relaxing Massages. If you so wish, you can book any treatment before your arrival. 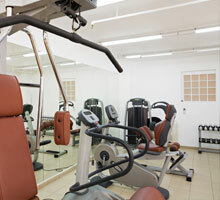 Modern Gym featuring "Technogym" equipment. Fully air conditioned and available all hours. Dedicated Coordination Services setting your requests about your life on the island during your stay (car rental, restaurant bookings and excursions). Chauffeur driven luxury cars, private yacht & sailing boat trips with captain, helicopter and aircraft services, private excursions, banqueting services and weddings.